“I love what I get to do every day and I am fortunate to have the opportunity to serve the kids of East Tennessee. Knoxville is a wonderful place to practice medicine and raise a family. It’s a great community that keeps getting better every year! Onward and upward! Joe has three children, Rebecca, Matthew and Andrew and a nearly one-year old granddaughter Evelyn. Barbara, his mother, lives in an assisted living facility in Knoxville and struggles with dementia. Joe leads a very active lifestyle and places a priority on his physical, emotional and spiritual health and well-being. He is an avid cyclist and passionate about road cycling. He also has competed in a variety of other athletic endurance events including marathon running, triathlons, multisport adventures, whitewater river rafting, hiking, etc. In 2015, he completed the Bicycle Tour of Colorado, a week-long event that covered 700 miles and 30,000 ft. of vertical climbing in the Rocky Mountains, crossing the Continental Divide twice at 12,000 ft. elevation above sea level. 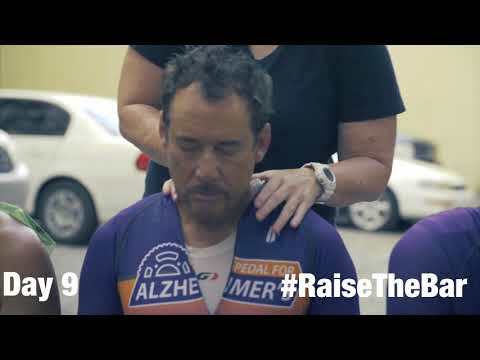 The opportunity to challenge himself again on the bicycle while at the same time supporting Alzheimer’s research and treatment really peaked his enthusiasm and interest. Pedal for Alzheimer’s is going to be an epic adventure and I am ALL IN for the second year!